The Center for Discovery’s Integrated Arts Department was truly proud to present “Swing into the Season” – the department’s annual holiday performance held at the Hurleyville Arts Centre. Back in July of 2018, Edgar Osorio, world-class ballroom dancer and the Director of the Ballroom Dance Program, and Sherma Williams, Director of the Therapeutic Dance Department, collaborated to develop the first ballroom dance program at The Center for Discovery, consisting of a twice weekly class with over 40 students, residents, and staff. Fast-forward five months later and with the hard work and profound dedication of all, the holiday performance – a song and dance celebration of the holidays, featuring students and adults from our program – was held. And thanks to Edgar Osorio, this year’s spectacular show included the addition of ballroom dance for the first time! Audience members, including family members and TCFD staff, enjoyed musical solos to some of our favorite holiday songs – like O Holy Night, Let It Snow, Merry Christmas Baby, and White Christmas – along with a fantastic trio performance to All I want for Christmas. Our residents certainly sang their hearts out and in turn, we left with full and happy hearts. Let’s not forget about the dance performances! Various dance styles that were featured throughout the show included the Fox Trot, Swing, the Waltz, the Tango, and the ChaChaCha – to the best and most beloved tunes! 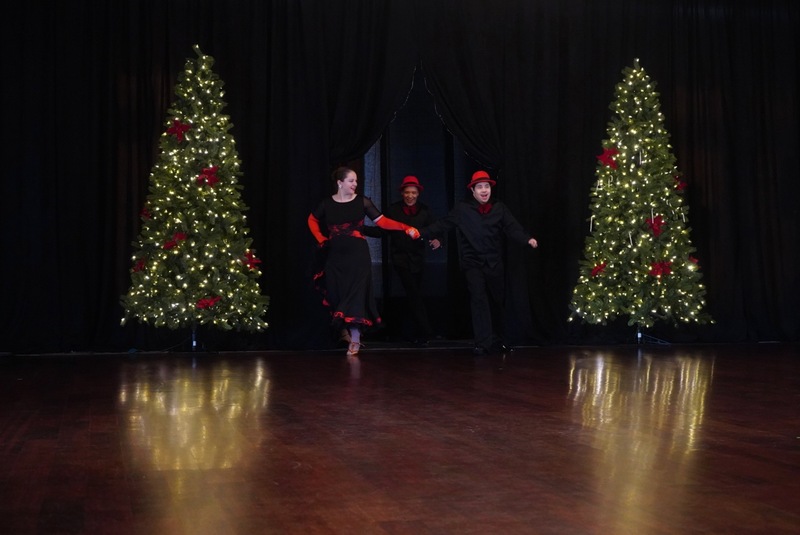 The audience “oohed” and “aahed” to a Rockin’ Around the Christmas Tree tap dance ensemble, a Tango to Little Drummer Boy (did we mention the beautiful costumes? ), a breathtaking Waltz to Carol of the Bells, and more. “What I love about our performances is that they have truly become a Center wide collaborative effort. For Swing Into the Season, this was elevated to a whole new level. Not only did our staff members provide support behind the scenes, but they also attended weekly rehearsals, learned complicated dance numbers, donned costumes, and became ballroom dance performers. Many of them stepped outside of the box for this performance, but they did it because of their unwavering commitment to the students and young adults in our program,” said Conio Loretto, III, MS, LCAT, MT-BC, Senior Director of Music Therapy at The Center for Discovery. It was a show full of triple threat performers (singer + dancer + actor), Carnegie Hall performers (yes, you read that right! ), but most of all – a show filled with spirit, with love, with kindness, and with beautiful smiles – on stage and in the audience. A show that was surely filled with holiday splendor! For more information about supporting our Integrated Arts programs, please contact Richard Humleker, Vice President of Development, at rhumleker@tcfd.org.